Here you will find an exploration of each of the levels from Halo 3: ODST. Hindsight: ODST is not a simple walkthrough or gameplay guide; instead you will find a thoughtful tour of a beautifully crafted game and the encounters, easter eggs, and fun found within. Much has already been said about ODST in the past. Ascendant Justice covered much ground many years ago with their series of articles and not too long ago we hosted a fantastic article by Shake Appeal that took a serious, in-depth look at ODST’s story, characters and meaning. 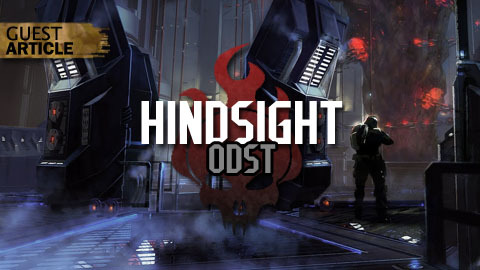 Hindsight: ODST is written by Dax01, a guest contributing writer. Select a level and begin reading. You can find images featured in the series in the Forward Unto Dawn Gallery‘s special Hindsight: ODST section. We’ are happy to discuss Hindsight: ODST or anything else regarding Halo fiction or game play in the Forward Unto Dawn Community Forums. I love what you guys are doing here. ODST is by far my favorite Halo game, mainly due to the environments. When I am on the Mombasa streets, I like to stare at the distant skyscrapers. Do you realize how tall those things actually are? I remember trying to count the stories of the tallest one, and I couldn’t see higher past 310 or so. Its impossible to count. + 1, I’m deep into the story and gameplay also, a big ODST fan, it’s where Firefight got it’s first release, a now standard feature of Halo games I agree the environments and ability to move from scene to scene in a continuous openworld stage, really get’s you in the mood to explore. I loved ODST the most, mainly because you were just an average human (Master Chief is still my favorite person of all time) killing a bunch of covenant. Hi there, I discovered your website by way of Google whilst searching for a comparable matter, your web site came up, it looks good. I’ve added to my favourites|added to my bookmarks.